That may be the most poignant fact of our lives. With the passing of time, inevitably, we lose our fellows. For as long as we humans have lived, among the best of our efforts, rising from the very core of our being, has been the effort to preserve memory. The result can be a building, a stone temple or pyramid, a work of art in the form of a painting or a sculpture, a fine piece of furniture, or elegant prose, or sometimes merely memories, preserved by word-of-mouth from generation to generation. Sometimes these rites of memory enlist tokens as vessels to evoke the memory, to preserve some tangible evidence of times gone by, of fellows lost to the tide. The Jahrzeit candles, standing as glowing memories of Susan's parents Sam and Lola, serve that purpose, humbly, ephemerally, for twenty or so hours every year. So it is with ScooterBob. 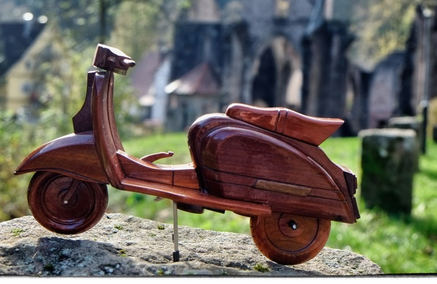 A plain, fragile, little wooden motor scooter, not very elegant, only a fair to poor model of the real thing, without the slightest value. Yet, to those who knew Bob Leong, either for having met him, or having followed his blog as he traveled on his motorcycle near and far, who hoped one day to host Bob on a tour of their favorite moto-haunts, and who were deprived of that opportunity by the cruel passing of time, the little wooden motor scooter is Bob's avatar. 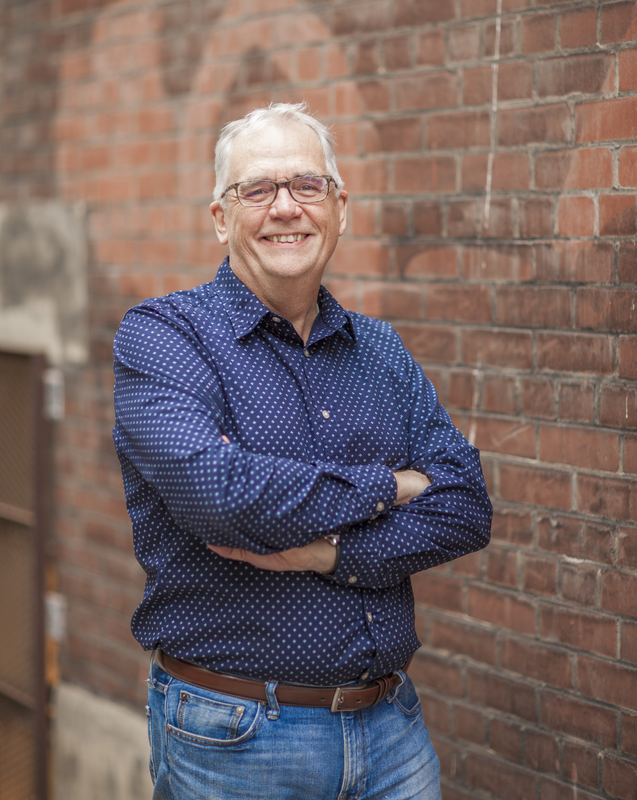 It has been handed from blogger to blogger, and witnessed people, places and things that Bob would surely have experienced, had he only been privileged with more time. Out in the world, as ScooterBob traveled the continents, another traveling thing was also making its way around the world in the care of motorcycle people. Vespa people actually, or more correctly, ModernVespa.com people. Meet Astronaut Snoopy. It left the Kennedy Space Centre in the spring of 2014 and has traveled far and wide. At one point last summer ScooterBob and Snoopy were in London at the same time, likely mere kilometers separating them. And now, by some amazing cosmic convergence that may well be related to dark matter, ScooterBob has landed in Jacksonville in the care of Bill Leuthold. ScooterBob's trek is far from over, its final destination will be the Leong residence in Vancouver. It was last there in May 2012. 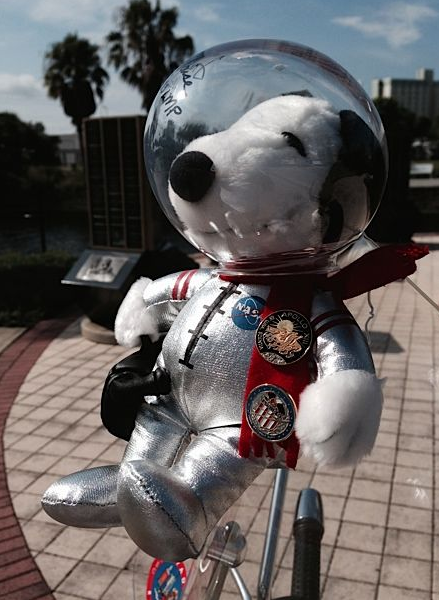 Bill will also be the last MVer to host Snoopy as it must return to NASA where it began its trek. Though the details are in the care of Bill and some kind folks at NASA, at the Kennedy Space Center, there will be an epic meetup of that rarest of species, the traveling things of the internet. I got to play a small role in allowing this convergence to happen, shepherding ScooterBob to Bill, and acting as a minor go-between for Bill and my friend Howard (MV's Kdude) who is presently showing Snoopy around South Beach in Miami. As I got the confirmation this afternoon that all the pieces were definitely falling together, I am not ashamed to say that I shed tears of sadness and joy. Sadness over the loss of loved ones, and joy as the tokens of their memory shine so brightly on this cold January afternoon. I poured myself a small glass of port, switched on my stereo system, lit up all my AirPlay speakers, and blasted Te Partiro all over the house, standing in the entrance hall, the taste of Port on my tongue, and tears rolling down my cheeks. ED. : I cross-posted this to Bob's blog, and most of the comments are posted there. I have been thinking of Bob too. Last night my Facebook came up with a three-year memory of meeting Bob, Roger, Andrea & Guido, Marianne, and Kathy in San Francisco. It wouldn't have all come together if it wasn't for our beloved Bobskoot. I miss him, je was humble, generous, and larger than life at the same time. i hope I am still on the list to receive my friend, I think he needs a tour of his home province or at least a part of it, and I would like to say good bye. Brandy I remember that get together. Bob was a catalyst. If you wanted something to happen, if anyone would find a way, it was Bob. Dar, check your e-mail. You used to be last on the list, just because of your location, but I bumped you. Now you're second to last, and I'm last. I just wanted to be the last one so I could see what all the mementos are. Bill gave us a peak, but I suspect we didn't see everything there was to see. Plus there's more to come. I am so looking forward to ScooterBob's arrival and certainly would have entertained the Space Pup as well. Their convergence is pretty cool.